Authenticity, thats something we take seriously when we make our Paw-radise cookies. Everything Is Made From Scratch. Never pre-frozen dough, Never pre-made cookies, No preservatives, No additives, Just Fresh Home Baked Cookies. 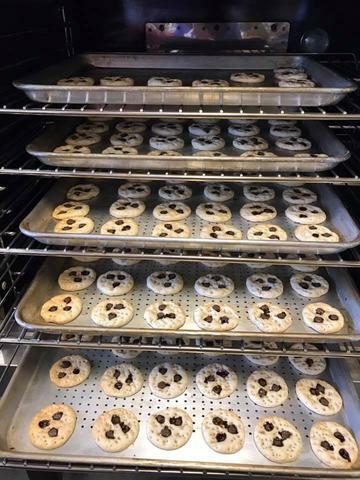 All our cookies are made in small batches and are hand cut to ensure consistency and quality that our customers expect. Sold in small 1-lbs bags or individually chosen and bagged to your preference. You havent had a real Doggy Pawty if you havent ordered one of our famous Cakes! Ranging from a Basic Bone Design and scriptre to Custom Cakes, we have something that can fit every Doggy Pawty theme. Come Visit us Monday thru Saturday and smell for yourself the freshness we have to offer! 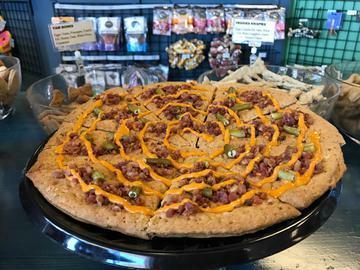 We are always trying to find the best pizza in town for ourselves, but perhaps we should start looking for the best pizza for our dogs! Slices of pizza are always on stock and are always made with different ingredients every batch, so its always a surprise!